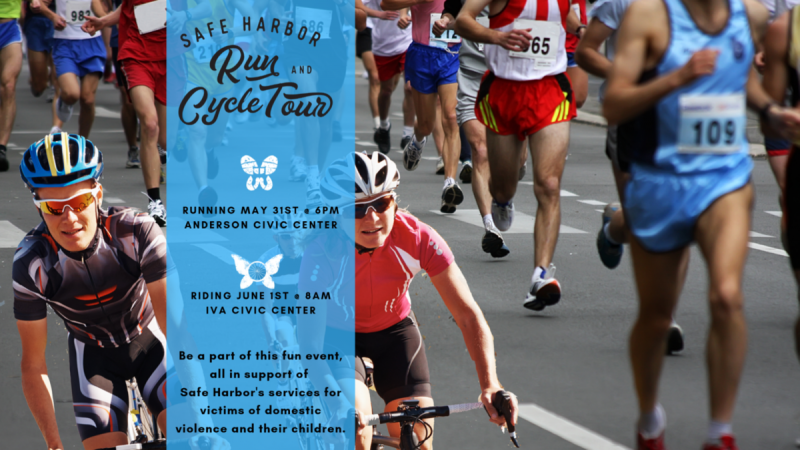 Register now for the Safe Harbor 5k Run and Cycle Tour! Join us for a fun evening 5K Run, an exhilarating early morning Cycle Tour, or if you’re really adventurous - you can do both! Be a part of this exciting event weekend, all in support of Safe Harbor's services for victims of domestic violence and their children. Gather at the Anderson Civic Center for a chip-timed 5K on a certified course. 5K registration includes: snacks and t-shirt. Enjoy a beautiful 25-mile, 42-mile or 65-mile metric century cycle ride through the rolling hills of southern Anderson County. This ride is perfect for experienced and novice cyclists alike! All courses begin and end at the Iva Civic Center in downtown Iva, SC. Cycle Tour registration includes: lunch pass, route map, snacks, SAG and t-shirt. All proceeds benefit Safe Harbor's programs and services for victims of domestic violence and their children.